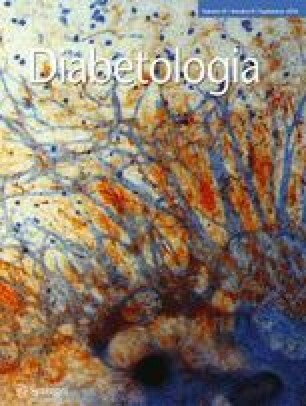 Amyloid deposition and inflammation are characteristic of islet pathology in type 2 diabetes. The aim of this study was to determine whether islet amyloid formation is required for the development of islet inflammation in vivo. Human islet amyloid polypeptide transgenic mice and non-transgenic littermates (the latter incapable of forming islet amyloid) were fed a low-fat (10%) or high-fat (60%) diet for 12 months; high-fat feeding induces islet amyloid formation in transgenic mice. At the conclusion of the study, glycaemia, beta cell function, islet amyloid deposition, markers of islet inflammation and islet macrophage infiltration were measured. Fasting plasma glucose levels did not differ by diet or genotype. Insulin release in response to i.v. glucose was significantly greater in both high vs low fat groups, and significantly lower in both transgenic compared with non-transgenic groups. Only high-fat-fed transgenic mice developed islet amyloid and showed a trend towards reduced beta cell area. Compared with islets from low-fat-fed transgenic or high-fat-fed non-transgenic mice, islets of high-fat-fed transgenic mice displayed a significant increase in the expression of genes encoding chemokines (Ccl2, Cxcl1), macrophage/dendritic cell markers (Emr1, Itgax), NACHT, LRR and PYD domains-containing protein 3 (NLRP3) inflammasome components (Nlrp3, Pycard, Casp1) and proinflammatory cytokines (Il1b, Tnf, Il6), as well as increased F4/80 staining, consistent with increased islet inflammation and macrophage infiltration. Our results indicate that islet amyloid formation is required for the induction of islet inflammation in this long-term high-fat-diet model, and thus could promote beta cell dysfunction in type 2 diabetes via islet inflammation. The online version of this article (doi: 10.1007/s00125-014-3304-y) contains peer-reviewed but unedited supplementary material, which is available to authorised users. Amyloid deposition  and inflammation  are both characteristics of the islet in type 2 diabetes. In humans with this disease, amyloid is associated with beta cell loss , while blockade of the proinflammatory cytokine IL-1β results in improved beta cell function and glucose tolerance . Recent studies suggest that the unique peptide constituent of amyloid deposits, human islet amyloid polypeptide (hIAPP), is capable of activating macrophages in vitro, resulting in increased expression of IL-1β, IL-1α and TNF-α [5, 6]. However, a relatively short-term in vivo study reported that high fat feeding in hIAPP transgenic mice only increased islet IL-1β expression . The aim of this study was to determine whether islet amyloid formation is required for the development of islet inflammation in vivo using a mouse model of islet amyloid formation. Male hemizygous transgenic mice with beta cell expression of hIAPP  on a F1 C57BL/6 × DBA/2 background were used with non-transgenic littermates as controls. Transgenic mice (C57BL/6) were bred with DBA/2 mice obtained from Jackson Laboratories (Bar Harbor, ME, USA). The study was approved by the Institutional Animal Care and Use Committee at VA Puget Sound Health Care System (VASPHCS). At 8–10 weeks of age, mice were randomly assigned to receive diets containing either 10% (low fat) or 60% (high fat) of energy derived from fat for 12 months (Research Diets, New Brunswick, NJ, USA). The mice had free access to food and water throughout the study. Body weight was measured at baseline and every 4 weeks thereafter. At 12 months, a subset of mice underwent an overnight fast followed by an IVGTT (1 g/kg dextrose) under pentobarbital sodium anaesthesia. Blood samples were drawn before and 2 and 5 min after glucose injection. The acute insulin response to glucose (AIRg) was calculated as the mean incremental insulin response above baseline from 2 to 5 min after glucose administration. Before the mice were killed, fat and lean mass was determined in 6–12 mice per group by proton magnetic resonance spectroscopy under pentobarbital anaesthesia. Quantification of amyloid area/islet area and beta cell area/islet area was performed on formalin-fixed, paraffin-embedded pancreas specimens labelled with thioflavin S to visualise amyloid deposits and insulin antibody to visualise beta cells  (for further details of antibodies used, please see ESM Table 1). Total islet, amyloid and beta cell areas were calculated using a computer-based quantitative method . Slides were treated with proteinase K for 15 min, stained with an F4/80 antibody (ESM Table 1), scanned in brightfield and analysed using Visiopharm Image Analysis, version 4.5.6.440 (Visiopharm, Hoersholm, Denmark). Islets were outlined manually and F4/80-positive area calculated using a project-specific configuration based on a threshold of pixel values. Pancreatic islets were isolated as described previously . RNA was isolated, reverse transcribed and gene expression determined by TaqMan real-time quantitative PCR using the primers listed in ESM Table 2. Each sample was run in triplicate, normalised to eukaryotic 18S rRNA and results calculated using the ΔΔCt method . Data are presented as mean ± SEM. Statistical significance was determined using the Mann–Whitney U test. A p value ≤0.05 was considered statistically significant. Body weight at baseline did not differ between low-fat-fed (LF) non-transgenic (29.7 ± 0.7 g), LF transgenic (28.1 ± 0.7 g), high-fat-fed (HF) non-transgenic (29.7 ± 0.6 g) and HF transgenic (29.9 ± 0.8 g) mice. The body weight in all groups increased over the 12 months of study, with the increase being greater in HF mice, regardless of genotype (Fig. 1a). The proportion of body weight consisting of fat was significantly higher in HF mice, with no difference between genotypes (Fig. 1b). Neither fed nor fasting (Fig. 1c) plasma glucose levels differed by diet or genotype at 12 months. Fasting plasma insulin levels were greater in HF non-transgenic (1329.5 ± 255.1 pmol/l) and HF transgenic (2654.1 ± 1116.3 pmol/l) mice compared with both LF groups (non-transgenic: 125.4 ± 21.2 pmol/l; transgenic: 134.7 ± 29.6 pmol/l). AIRg was significantly greater in both the HF vs LF groups (Fig. 1d), and in non-transgenic compared with transgenic groups fed the same diet (Fig. 1d). Non-transgenic mice on both diets and LF transgenic animals did not develop islet amyloid. In contrast, 80% of HF transgenic animals developed islet amyloid, with 7.3 ± 2.6% of islet area occupied by amyloid (Fig. 1e). Beta cell/islet area was not different between the LF groups, but tended to be decreased in HF transgenic vs HF non-transgenic mice (p = 0.07) (Fig. 1f). F4/80-positive/islet area was significantly elevated in HF transgenic mice vs LF transgenic and HF non-transgenic animals (Fig. 2a–d). Compared with islets from LF non-transgenic mice, F4/80-positive/islet area was also increased in islets of LF transgenic and HF non-transgenic mice. As illustrated in Fig. 2e, compared with HF non-transgenic mice, HF transgenic mice had significantly increased islet expression of genes encoding the chemokines known as chemokine (C-C motif) ligand 2 (CCL2) and chemokine (C-X-C motif) ligand 1 (CXCL1), macrophage/dendritic cell markers F4/80 (also known as EGF-like module-containing mucin-like hormone receptor-like 1, EMR1) and CD11c (also known as integrin alpha X, ITGAX), inflammasome components NACHT, LRR and PYD domains-containing protein 3 (NLRP3), PYD and CARD domain containing (PYCARD) and caspase 1 (CASP1), as well as proinflammatory cytokines IL-1β, TNF-α and IL-6. In addition, compared with LF transgenic mice, HF transgenic mice had significantly increased islet expression of genes encoding CCL2, CXCL1, F4/80, CD11c, CASP1, IL-1β, TNF-α and IL-6. In contrast, there were no significant differences in the expression of these same genes in LF vs HF non-transgenic mice and transgenic vs non-transgenic mice on the low-fat diet. We have observed that islet amyloid formation is associated with increased islet expression of mRNAs for chemokines, macrophage/dendritic cell markers, NLRP3 inflammasome components, and proinflammatory cytokines, along with increased staining of macrophages. Thus, our findings emphasise the important role of amyloid in islet inflammation. After 12 months of being fed a high-fat diet, in the transgenic mice we observed islet amyloid formation and increased expression of genes encoding chemokines (Ccl2 and Cxcl1), macrophage and dendritic cell markers (Emr1 and Itgax), components of the NLRP3 inflammasome (Nlrp3, Pycard, Casp1), and proinflammatory cytokines (Il1b, Tnf and Il6). In contrast, none of these changes were observed in non-transgenic mice on the high-fat diet or transgenic mice on the low-fat diet, in keeping with amyloid formation being the mechanism by which these inflammatory changes occurred. We also observed increased macrophage staining in islets of HF transgenic mice, consistent with amyloid deposition being associated with an increased number of activated macrophages. These findings are consistent with, but expand on, those of Westwell-Roper et al . In their hIAPP transgenic mice fed a high-fat diet for 14 weeks they did not observe amyloid deposition, and only observed increases in Emr1, Nlrp3 and Il1b compared with non-transgenic mice on the same diet. In addition, in these same hIAPP transgenic mice they did not observe increases in Ccl2, Casp1, Pycard and Tnf mRNA levels, and did not report on Il6 mRNA levels. In fact, the phenotype we observed is more in keeping with the in vitro observation by Westwell-Roper et al whereby the exogenous application of amyloidogenic hIAPP to islets or macrophages induced expression of Ccl2, Emr1, Nlrp3, Casp1, Il1b, Tnf and Il6 compared with the application of non-amyloidogenic rodent IAPP. Westwell-Roper also observed an increase in Il1b expression in hIAPP transgenic vs non-transgenic mice, both fed a chow diet. We did not observe such a change but found F4/80 staining to be increased and AIRg to be decreased in hIAPP transgenic mice fed the low-fat diet when visible amyloid was not present. These amyloid-independent effects might be mediated by early/small aggregates of IAPP. Interestingly, the high-fat diet alone also increased the proportion of F4/80-positive staining. This suggests that exposure to a high-fat diet or expression of low levels of IAPP recruits macrophages, with the full-blown inflammatory response involving IL-1β, IL-6 and TNF-α requiring greater amounts of amyloid that are visible by light microscopy. We and others have previously demonstrated that hIAPP application to macrophages and dendritic cells in vitro activates the NLRP3 inflammasome, resulting in the production of the proinflammatory cytokine IL-1β [5, 6, 7]. Westwell-Roper et al provided evidence that beta cells themselves are not a major source of IL-1β but, rather, islet macrophages are responsible for IL-1β production [5, 7]. Our observations of increased chemokine gene expression and F4/80 staining suggest that islet amyloid formation is likely associated with the recruitment of macrophages to the islet. The increases in the expression of the genes encoding the proinflammatory cytokines IL-1β and TNF-α are likely to have resulted from the increase in macrophage activation and these, in turn, may also have contributed to the decreased insulin release we observed in hIAPP transgenic mice that developed islet amyloid. We have previously reported that amyloid deposition in our mouse model is associated with decreased beta cell area . We observed a trend towards reduced beta cell area in our current study (p = 0.07), and this statistical non-significance is likely to be due to the smaller sample size. Our findings thus suggest that islet inflammation may also contribute to decreased beta cell area. In conclusion, islet amyloid formation in hIAPP transgenic mice is associated with inflammation, which may lead to beta cell loss and thus contribute to the progression of the islet lesion in type 2 diabetes. We thank B. Barrow, M. Peters, J. Willard, P. Bergquist, C. Braddock and A. Rahman (all Seattle Institute for Biomedical and Clinical Research, Seattle, WA, USA) for excellent technical support. This work was supported by the Department of Veterans Affairs (SEK), DK-074404 (RLH), DK-080945 (SZ) and DK-017047. DTM was supported by a Swiss National Foundation Fellowship and the University of Washington McAbee Fellowship. TS was supported by an American Diabetes Association Mentor-Based Fellowship. DTM contributed to the study design, performed research, analysed data and wrote the manuscript. MM performed research, analysed data and reviewed/edited the manuscript. TS helped interpret the data and reviewed/edited the manuscript. SZ, RLH and SEK contributed to the study design, helped interpret the data and reviewed/edited the manuscript. All authors approved the final version. DTM is responsible for the integrity of the work as a whole.